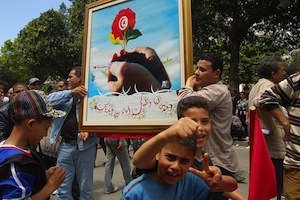 GENEVA, May 9 2012 (IPS) - Lingering violence, intolerance and oppression in Tunisia, following the ousting of former dictator Zine el-Abidine Ben Ali in January 2011, tells the revolutionaries who sparked the Arab Spring that their work is just beginning. Most believe that the revolution never ended, and that a second wave of protest is not far off. Islamic fundamentalists represented by Salafists have presented themselves as the biggest challenge to Tunisian democracy. By sanctioning and inciting violence against more progressive forces in the country, they are filling the cultural and political vacuum left by Ben Ali, whose regime effectively shackled freedom of expression, especially among the youth. On Apr. 21 and 22, Jawhar Ben M’barek, the speaker for the social democratic group Doustourna, was violently assaulted by fanatics in the southern towns of Douz and Souk El Ahad, with the perpetrators going so far as to call for his death. An undefined group of Salafists and others, acting in the name of ‘Muslim identity’, are responsible for these acts of aggression, which are becoming increasingly commonplace as traditionalists try desperately to steer the country’s post-revolutionary development with conservative reins. Adnan Hajji, a member of the national trade union UGTT and former coordinator of the upheaval in the Gafsa mines in 2008, told IPS that “the situation is blocked because this government doesn’t want to listen and to negotiate with representatives of the different regions or with the “outraged”. The police are aggressive; the Salafists, supported by the (recently elected Islamist) Ennahda party, attack the media and civil society activists,” he lamented. Tunisia has long boasted a very progressive family code and Tunisian women are seen as some of the most liberated in the region. Now these freedoms are at risk, with Salafists clamouring for a return to a more “traditional” society. “The way Tunisian society is evolving is worrisome because some are trying to impose limits to individual freedoms. The biggest threat is the expression of violence,” Tunisian filmmaker Salma Baccar, currently in Geneva to chair the International Oriental Film Festival, told IPS. The renowned artist – whose movie ‘Fatma 19’ has been censored for 36 years because it attributed Tunisian women’s progressive status not to the statesman Habib Burguiba but to a long cultural evolution – had never before been tempted by politics. In February 2011, when 280,000 sub-Saharan African migrants fled worn-torn Libya to seek refuge in southern Tunisia, she decided to build a “cultural tent” to play music and movies, for which she was assaulted by the Islamic fundamentalist Salafists. It was then that she realised that culture needed to go hand in hand with politics. She joined the Democratic Pole and in October 2011 was elected to the constitutional assembly. She considers the progressive status of Tunisian women to be “irreversible”, but admits to being “a bit worried” by the situation in the country, particularly after Ennahda won the constitutional assembly elections. Baccar says she would like to see another revolution, but a cultural one this time. Because this fundamental right was violated for so long, young people today are starting to express themselves exclusively through violence. Most of those who resort to aggression and attacks come from neglected regions and impoverished neighbourhoods, she added. For her, these “cultural losers” are the biggest problem in today’s Tunisia, more of a liability than the 800,000 unemployed. Even the youngsters who went to colleges and universities were not truly educated – rather, their minds were emptied of any form of free expression, and some have turned into fanatics. “This (was) Ben Ali’s worst crime against our society and remedying it will be a long term task.” She warned that society should also keep a close watch on primary schools, where many children are indoctrinated with reactionary ideas at a very early stage. “In some maternal schools, mothers are encouraged to veil their daughters. That is where the fight starts: we have to invest in childhood and in the youngsters,” she stressed. “This government doesn’t know where it is going,” he complained. The constitutional assembly, which was supposed to complete its work by March 2013, has to act quickly. The lack of a strict time frame within which to draft the constitution worries him, since the initial date of March 2013 has not been confirmed. Hajji believes Ennahda is quickly losing the trust and support of its voter base. Though the party won the elections quite comfortably, only 46 percent of eligible voters turned out on polling day, while the majority abstained. Next time around, Ennahda might not be first in line if they fail to deliver concrete solutions in the post-revolutionary period.